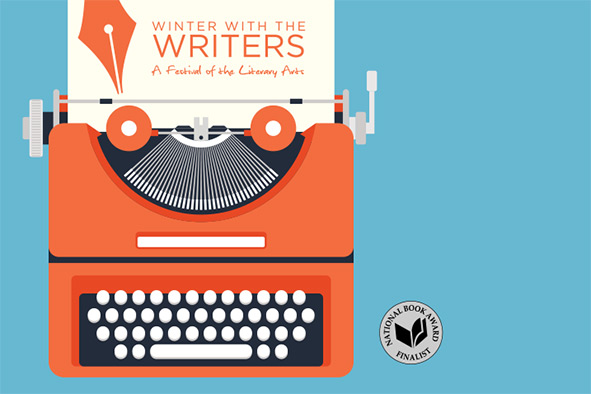 Winter With the Writers, a festival of the literary arts, is sponsored by the Irving Bacheller Creative Writing Endowment, the Thomas P. Johnson Distinguished Visiting Scholar and Artist Fund, Winter With the Writers patrons, and the Rollins College Department of English. Winter With the Writers is expected to generate even more buzz now that it’s affiliated with the nation’s premier literary event. Winter with the Writers is part of a long tradition of literary excellence at Rollins College, first in the continuing tradition of supporting living authors and also as a direct descendant of the Animated Magazine, established by Hamilton Holt, the eighth president of Rollins College. The Animated Magazine presented an eclectic program of speakers during high winter before an audience of subscribers that often numbered in the thousands. Over a span of forty years, statesmen, political and sports figures, actors, and notable writers read their pieces or spoke—Greer Garson, Bob Feller, James Cagney, Omar Bradley, J. Edgar Hoover, Fannie Hurst, Henry Luce, Henry Morganthal, Claude Pepper, Mary Pickford, Mohammed Ali, among others. The series began in 1927, introducing to the Rollins College and Winter Park communities the editor of the poetry column of The New York Times, Jessie Rittenhouse. The collection of her letters of correspondence with many important poets of the early 20th century can be found in the Olin Library archives, including her correspondence with Eliot, Pound, Hart Crane, Robert Frost, Elinor Wylie, Amy Lowell, E.A Robinson, and Allen Tate. Other featured writers in the Animated Magazine series included Ogden Nash, John Erskine, Allen Drury, and Carl Sandburg, who first lectured in the Knowles Hall on March 30, 1928, and then returned for the 1940 animated magazine and received an honorary degree from Rollins on February 26, 1940. Several of her plays were staged at Rollins, including “From Sun to Sun” in 1933 and “All de Live Long Day”, in 1934. Other writers who have been a part of the literary milieu at Rollins College include Sinclair Lewis, in 1941 and in 2007 Maya Angelou. Manuscript page and photo with past presidents. Other elements of the literary culture that WWW derives from are material—like the collection of Walt Whitman papers in Olin Library that includes a manuscript page of “Democracy” and a hand-written note—and some are abstract, particularly the enduring belief in popular eloquence. In 2016, Rollins College will begin a partnership with the National Book Foundation (NBF) to bring to campus two National Book Award (NBA) finalists. As one of four colleges and universities engaged with the National Book Awards on Campus program, and sole representative of the Southeast region, Rollins continues its long tradition of sponsoring the very best in contemporary literature. Carol Frost, Winter With the Writers director, and Carol Lucas, executive director of the NBF, will work together to select which finalists or winners will speak at Rollins. From there, they’ll develop a schedule that includes public and private events and a live-streamed Q&A. Carol Frost, director of Winter with the Writers, A Festival of the Literary Arts, is the author of twelve books of poems. The Queen's Desertion, I Will Say Beauty, Love and Scorn: New and Selected Poems, all from Northwestern University Press, are recent volumes. Her 2010 collection of poems, Honeycomb, was the recipient of the Gold Medal in Poetry from the Florida Book Awards, and in 2014 Tupelo Press published Entwined:Three Lyric Sequences. Her poems have appeared in four Pushcart Prize anthologies, and she has been a recipient of two National Endowment for theArts fellowships. The Poets’ Prize and Elliston Award committees have also honored her work. She has published poems in The Atlantic Monthly, American Poetry Review, Gettysburg Review, Kenyon Review, The New York Times, Poetry, Shenandoah, TriQuarterly,and Virginia Quarterly Review. Her poems also appear in recent anthologies--The New Anthology of American Poetry, Volume 3: Postmodernisms, 1950 to the Present, Contemporary American Poetry and When She is Named Fire: An Anthology of Contemporary Poetry by American Women. In addition, her essays on poetics have appeared in print, largely in the New England Review, and on the Web. The Web publication sites include Modern American Poetry, Poetry Daily, Plume, and Poets.org from the Academy of American Poetry. In October 2008 her piece on Robert Frost, Sincerity and Inventions: On Robert Frost, was posted on the Academy of American Poets website. Carol Frost founded and for fifteen years directed the Catskill Poetry Workshop, and she served as poetry editor for Pushcart Prize XXIII in 2003 and as a poetry judge for the 2005 National Book Award. She has held distinguished professorships at Bucknell University, Washington University and Wichita State University. She also has taught at the Bread Loaf Writers’ Conference, the Sewanee Writers’ Conference, Poets at Work in Salt Lake City, the Five Island Press poetry conference in Australia, and for the MFA programs at Warren Wilson College and New England College. In the fall of 2008 she held the National Endowment for the Humanities Distinguished Professorship at SUNY Potsdam. Carol Frost is the Theodore Bruce and Barbara Lawrence Alfond Professor of English at Rollins College, Winter Park, Florida. She spends time and writes each spring on Florida's "Nature Coast" and for a few weeks each summer at Elizabeth Bishop's childhood home in Great Village, Nova Scotia, which she owns in partnership with a group of American and Nova Scotian scholars and writers. Four to six master classes occur each festival season, and the community is welcome to come and listen in. The format for the classes varies with each author deciding what elements of writing to address and how to address them, and Rollins students are schooled in the possible responses to their work. Imagine the thrill for undergraduate poets and undergraduate short story writers to have nationally and internationally known masters spend time with their work. Imagine, instead, hearing a National Book Award winner or the poet laureate speak extemporaneously about the art and craft of fiction or poetry. How does an early draft reach beyond its original potential? Can you know when a story is finished? Master classes offer Rollins students and the often-large audience the opportunity to hear a secret now and then about the creative process. Whenever the format for the class is a workshop, you have the opportunity to read the work beforehand. Poems and stories will be posted on the page dedicated to each writer in February.